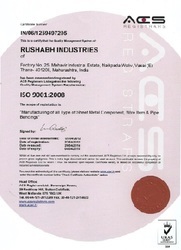 Established in the year 1998, we, Rushabh industries, are one of the leading manufacture and suppliers of Industrial Components. Our range consists of Deep Drawn Sheet Metal Parts, Rubber Bonded Sheet Metal Parts and Precision Sheet Metal Parts. These products are widely admired by the patrons due to their sturdy construction, longer service life, exceptional performance and cost-effectiveness. We have top notch manufacturing unity which has is equipped with the modern machinery to accelerate the speed of the production process and enhance the quality of the manufactured products. We are supported with the talented professionals who have the knowledge to operate the machinery with expertise. All the manufactured products follow the international quality standards in the whole process. By manufacturing and supplying best in class product assortment to our prestigious clients, we always try to make a mutually beneficial and long-term relationship with our client. Being a quality conscious entity, the finest quality of the offered product assortment is maintained through numerous quality assurance examinations performed by our team of quality experts. Leveraging to our vast distribution facility, we have been able to deliver the offered product array at the customers’ end within the limited time frame. Under the able and efficient supervision of our mentor, Mr. Dhiren Karani, who has a vast experience in this field, we have established a strong foothold in the market. His transparent business dealings and in-depth industry knowledge have helped us in reach the top of success and maintain a huge clientele. Our firm strives to accomplish all quality testing standards and policies, in order to earn the huge clientele across the nation. For the maintenance of quality in products, our company has established a separate and state of art department of quality testing. Here, our whole offered collection goes for several rigorous checking processes, which are being carried out by professional’s team of quality controllers. The excellent quality of our products and our client-friendly services has enabled us to attain client satisfaction. The fact that we manufacture products of unmatched quality and supply them to clients at highly economical prices has made us a highly preferred organization for them. Our provision of quality and quantity at cheap market rates has endeared us to clients and made us one of the best known manufacturers of industrial tools. As a result of our efficiency, we have acquired a huge clientele since our inception. We are backed by a team of hardworking professionals that helps us in providing our customers with a wide range of Industrial Components. All our team members have wide experience in their respective field, and help us provide our customers with a precision-engineered range of Industrial Components as per their needs. Since our establishment, we have been engaged in manufacturing and supplying of a wide assortment of Industrial Components. Our ethical policies and transparent business dealings have enabled us to garner a huge clientele across the nation. The infrastructure of our company is well organized and perfectly equipped by modern facilities. The various sectors of our infrastructure are equipped with new technology based machines and equipment. All the sectors work smoothly under the guidance of their operational heads. Moreover, with the help of our infrastructure facility we are successfully providing high quality products to the clients on time in perfect packaging.